We go hands on the real guitar game for real guitarists. One of the hottest tickets at this year's show is Ubisoft's Rocksmith. After so many years of back-and-forth between Rock Band and Guitar Hero, Ubisoft's new guitar game may have just beat them both, at least as far as the guitar goes. Where those other games have come close, particularly with Rock Band's Pro Mode and peripherals, Rocksmith removes almost every abstraction and compromise the guitar game genre has seemed to force upon us. Rocksmith has you playing a real guitar with real techniques and real sounds. Located in a black bus between the two exhibit halls, Rocksmith has had a massive line throughout the entire show. So this morning, I showed up an hour before the show opened, hoping to get a jump on the crowd. I stepped onto the bus and found the girls working the show for Rocksmith getting a private demo from one of the guitarists Ubisoft hired to demo the game. I introduced myself and got to play on one of the game stations for almost an entire hour, until the Ubisoft folks basically had to ask me to stop being so selfish and let someone else try it out. The game works by letting you play through a few dozen songs from popular acts. The music selection in the build I played wasn't exactly breathtaking, at least not compared to the other guitar games, but the presence of favorites like Nirvana, Stone Temple Pilots and The Animals mean there's at least a couple of songs you'll know here. The tracking is fantastic. I played through The Animals' "House of the Rising Sun," and the game kept track of every arpeggio and was even slick enough to give me credit for playing the same chords in different positions up and down the neck. It's not uncommon for guitarists to switch things up when playing the same progression over and over again, so having Rocksmith recognize that and still give you high marks for playing different ways is fantastic. During one of the mini-games for instance, players will have to shoot flying ducks by picking certain notes on the guitar. But if the duck was flying about the 8th fret on the low E string, I was still able to take him out by playing the same note on the 3rd fret of the A string. Heck, I was even able to take him out by playing the 7th fret and bending it up a half step. Okay, the duck thing sounds kind of cheesy, but it's neat way to add a distraction and motivation for your practice. There are a few of these practice modes in the game, and the better you do, the longer you can play. Learning tremolo effects by rapidly picking a string to make a roadrunner move is more fun than just picking the string with no real feedback. When playing a song, you can use the default tone selected by the game (which is of course, very dependent on your guitar), or choose from a massive selection of amp models and effects pedals. Want a super clean American tube amp? You've got lots. Tweedy British distortion? There are plenty of those too. You can add in up to 100 pedals in an effects loop as well, so every single flange, chorus, reverb, auto wah, or delay effect you could want is right at the tip of your fingers. You'll even be able to dial in all of the relevant knobs to get just the right tone. There are three separate pre-sets you can use for this, and you can call up these custom tones even when playing along with one of the game's library of 20-30 songs. (Another 20-30 should be available for download at launch.) You can even change the speaker size of your cabinets and adjust the microphone position. At the very least, the game seems like a great substitute for a practice amp. Right now there are really only a few downsides to the game. The first, and least important, is that there's still just the slightest bit of latency. It's not enough to throw you off, but when it comes to music, even the slightest bit of delay can throw you off your groove. The bigger downside, and the reason that Rocksmith will not entirely replace the Rock Band experience, is that it seems to be a solo affair. 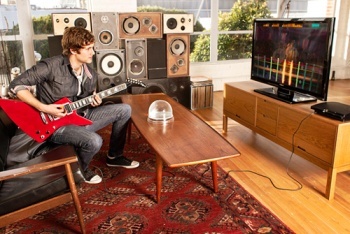 Most of us have learned to view the music game as a party experience, but Rocksmith feels somehow more personal. The only other potential downside is that the game might not feel enough like a game for people who aren't already heavily invested in playing the guitar to care. After all, you need your own guitar to play the game, which will limit the audience considerably. Even with those two strikes against it, Rocksmith is the real deal. Guitarists who dislike the current guitar controllers will be excited to sit down with their own guitar and play actual guitar music. So let me lay out the highest praise a videogame writer can offer: I am going to pre-order this with my own money.